Errrrr… maybe we shouldn’t… but we REALLY should. As I have shared before, I was SO addicted to sugar. It’s still a huge fight for me daily, but not nearly as bad as it was. Before I did Whole30 I knew I ate a lot of sugar, because I was constantly craving it, but I had no idea how much! Every night, I would put my kids to bed, my husband would go to bed and I would start the cravings. Something with sugar, anything! (Preferably ice cream.) I was stuck in this endless cycle of craving, giving into my craving, emotional eating, giving into my craving, not liking how I looked or felt, emotional eating, crying, and so on. It seemed like I would never be able to get control of myself! As a friend of mine just shared revelry, sugar was my drug. It was the first thing I turned to when I had a hard day, it was what I craved when I was having a good day, it’s what I wanted ALL the time. I couldn’t get enough of it. I was the epitome of a sugar addict. Today, I was curious what a simple search on the all knowing Google would come up with about sugar. First I searched “Different types of sugar” and what I found was disturbing. Over 60 different names/ types of sugar or added sweetners. 😳 And this isn’t even all of them. 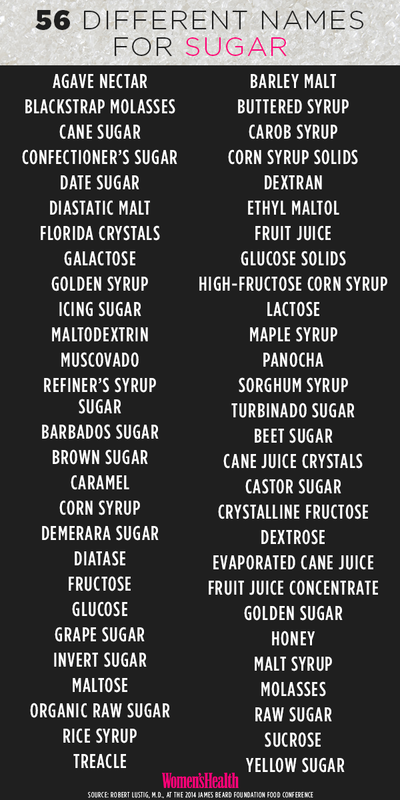 Before you say, “Oh well I don’t eat THAT much sugar!” Start reading your labels. Not just stuff you suspect sugar is in, ALL of your labels. Here’s what happened when I did. I got angry. So angry! Why does our country allow sugar to be in literally everything. That’s not even a joke. Sandwich meat, bread, potatoes chips, bacon, dried fruit, nuts, chicken broth, precooked meats, sausages, mayo, mustard, etc. I could go on and on about it! Food that doesn’t NEED sugar in it, guess what, there’s some sort of sugar. And it’s cleverly disguised in there too. Unless you know they names of sugar, you won’t even think twice about having brown rice syrup in it! Like I just said, there is sugar in EVERYTHING. So you and I unsuspectingly eat “normal” food not realizing we are consuming large amounts of sugar, and then too it off with a pint of Ben and Jerry’s or peanut butter cups because “We deserves treat every now and again!” Not realizing what affects the mass amounts of sugar are having on our bodies. Here’s an example. 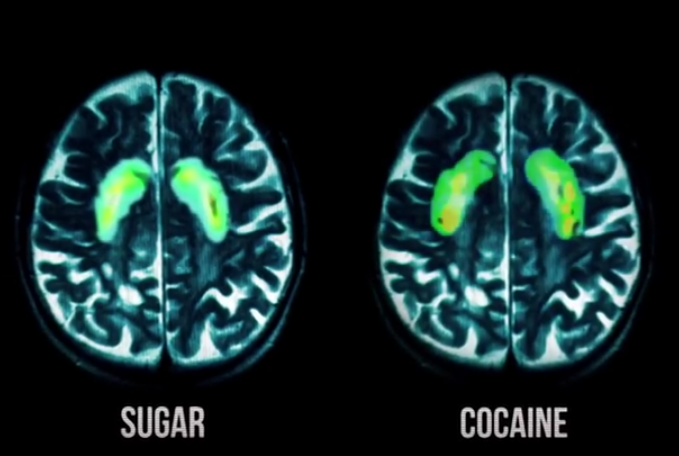 I’ve heard people say that sugar is more addictive than cocaine. And being a sugar addict I can tell you, I wouldn’t doubt that. I’ve never done cocaine so I can’t compare and contrast the two but I’ve struggled for years with a sugar addiction. Here is someone I found VERY interesting. 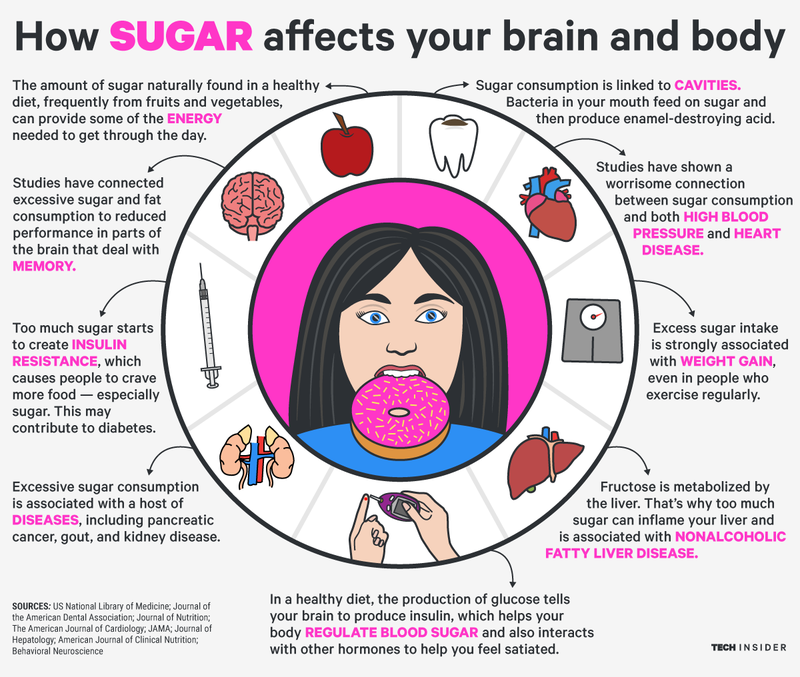 So when you add- mass amounts of sugar hidden in all KINDS of our food and the addictiveness of sugar, you get a country that’s subconsciously addicted to sugar. A country wondering why we have record cases of Type 2 diabetes, heart disease, obesity, high blood pressure, cancer, auto immune disorders and so much more. -74% of prepackaged foods have hidden ADDED sugar. -On average Americans eat about 15 teaspoons of ADDED sugar daily! Now, I am not a doctor or a nutritionist, BUT, all of this information is found on a quick and easy Google search! Educate yourselves about what you put in your body. Because if you don’t, we will just continue to raise a country full of diabetic obese sugar addicts. We deserve more than that! Our kids deserve more than that! Be informed! Start the change! We should have a say as to what is in our food!! Previous postWhy don’t we care? Next postNew year, new discipline.